This article is about the air force of the United Kingdom. For other uses, see Royal Air Force (disambiguation) and RAF (disambiguation). "Through Adversity to the Stars"
The RAF's mission is to support the objectives of the British Ministry of Defence (MoD), which are to "provide the capabilities needed to ensure the security and defence of the United Kingdom and overseas territories, including against terrorism; to support the Government's foreign policy objectives particularly in promoting international peace and security". The RAF describes its mission statement as "... [to provide] an agile, adaptable and capable Air Force that, person for person, is second to none, and that makes a decisive air power contribution in support of the UK Defence Mission". The mission statement is supported by the RAF's definition of air power, which guides its strategy. Air power is defined as "the ability to project power from the air and space to influence the behaviour of people or the course of events". Today the Royal Air Force maintains an operational fleet of various types of aircraft, described by the RAF as being "leading-edge" in terms of technology. This largely consists of fixed-wing aircraft, including: fighter and strike aircraft, airborne early warning and control aircraft, ISTAR and SIGINT aircraft, aerial refueling aircraft and strategic and tactical transport aircraft. The majority of the RAF's rotary-wing aircraft form part of the tri-service Joint Helicopter Command in support of ground forces. Most of the RAF's aircraft and personnel are based in the UK, with many others serving on operations (principally over Iraq and Syria) or at long-established overseas bases (Ascension Island, Cyprus, Gibraltar, and the Falkland Islands). Although the RAF is the principal British air power arm, the Royal Navy's Fleet Air Arm and the British Army's Army Air Corps also deliver air power which is integrated into the maritime, littoral and land environments. While the British were not the first to make use of heavier-than-air military aircraft, the RAF is the world's oldest independent air force: that is, the first air force to become independent of army or navy control. Following publication of the "Smuts report" prepared by Jan Smuts the RAF was founded on 1 April 1918, with headquarters located in the former Hotel Cecil, during the First World War, by the amalgamation of the Royal Flying Corps (RFC) and the Royal Naval Air Service (RNAS). At that time it was the largest air force in the world. After the war, the service was drastically cut and its inter-war years were relatively quiet, with the RAF taking responsibility for the control of Iraq and executing a number of minor actions in other parts of the British Empire. The RAF's naval aviation branch, the Fleet Air Arm, was founded in 1924 but handed over to Admiralty control on 24 May 1939. The RAF developed the doctrine of strategic bombing which led to the construction of long-range bombers and became its main bombing strategy in the Second World War. The RAF underwent rapid expansion prior to and during the Second World War. 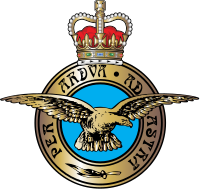 Under the British Commonwealth Air Training Plan of December 1939, the air forces of British Commonwealth countries trained and formed "Article XV squadrons" for service with RAF formations. Many individual personnel from these countries, and exiles from occupied Europe, also served with RAF squadrons. By the end of the war the Royal Canadian Air Force had contributed more than 30 squadrons to serve in RAF formations, similarly, approximately a quarter of Bomber Command's personnel were Canadian. Additionally, the Royal Australian Air Force represented around nine percent of all RAF personnel who served in the European and Mediterranean theatres. In the Battle of Britain in 1940, the RAF (supplemented by 2 Fleet Air Arm Squadrons, Czechoslovak, Polish and other multinational pilots and ground personnel) defended the skies over Britain against the numerically superior German Luftwaffe. In what is perhaps the most prolonged and complicated air campaign in history, the Battle of Britain contributed significantly to the delay and subsequent indefinite postponement of Hitler's plans for an invasion of the United Kingdom (Operation Sea Lion). In the House of Commons on 20 August, prompted by the ongoing efforts of the RAF, Prime Minister Winston Churchill eloquently made a speech to the nation, where he said "Never in the field of human conflict was so much owed by so many to so few". The largest RAF effort during the war was the strategic bombing campaign against Germany by Bomber Command. While RAF bombing of Germany began almost immediately upon the outbreak of war, under the leadership of Air Chief Marshal Harris, these attacks became increasingly devastating from 1942 onward as new technology and greater numbers of superior aircraft became available. The RAF adopted night-time area bombing on German cities such as Hamburg and Dresden, and developed precision bombing techniques for specific operations, such as the "Dambusters" raid by No. 617 Squadron, or the Amiens prison raid known as Operation Jericho. Following victory in the Second World War, the RAF underwent significant re-organisation, as technological advances in air warfare saw the arrival of jet fighters and bombers. During the early stages of the Cold War, one of the first major operations undertaken by the Royal Air Force was in 1948 and the Berlin Airlift, codenamed Operation Plainfire. Between 26 June and the lifting of the Russian blockade of the city on 2 May, the RAF provided 17% of the total supplies delivered during the event, using Avro Yorks, Douglas Dakotas flying to Gatow Airport and Short Sunderlands flying to Lake Havel. Before Britain developed its own nuclear weapons the RAF was provided with American nuclear weapons under Project E. However following the development of its own arsenal, the British Government elected on 16 February 1960 to share the country's nuclear deterrent between the RAF and submarines of the Royal Navy, first deciding on 13 April to concentrate solely on the air force's V bomber fleet. These were initially armed with nuclear gravity bombs, later being equipped with the Blue Steel missile. Following the development of the Royal Navy's Polaris submarines, the strategic nuclear deterrent passed to the navy's submarines on 30 June 1969. With the introduction of Polaris, the RAF's strategic nuclear role was reduced to a tactical one, using WE.177 gravity bombs. This tactical role was continued by the V bombers into the 1980s and until 1998 by Tornado GR1s. For much of the Cold War the primary role of the RAF was the defence of Western Europe against potential attack by the Soviet Union, with many squadrons based in West Germany. The main RAF bases in RAF(G) were RAF Bruggen, RAF Gutersloh, RAF Laarbruch and RAF Wildenrath - the only air defence base in RAF(G). With the decline of the British Empire, global operations were scaled back, and RAF Far East Air Force was disbanded on 31 October 1971. Despite this, the RAF fought in many battles in the Cold War period. In June 1948 the RAF commenced Operation Firedog against Malayan terrorists during the Malayan Emergency. Operations continued for the next 12 years until 1960 with aircraft flying out of RAF Tengah and RAF Butterworth. The RAF played a minor role in the Korean War, with flying boats taking part. From 1953 to 1956 the RAF Avro Lincoln squadrons carried out anti-Mau Mau operations in Kenya using its base at RAF Eastleigh. The Suez Crisis in 1956 saw a large RAF role, with aircraft operating from RAF Akrotiri and RAF Nicosia on Cyprus and RAF Luqa and RAF Hal Far on Malta as part of Operation Musketeer. The Konfrontasi against Indonesia in the early 1960s did see use of RAF aircraft, but due to a combination of deft diplomacy and selective ignoring of certain events by both sides, it never developed into a full-scale war. One of the largest actions undertaken by the RAF during the cold war was the air campaign during the 1982 Falklands War, in which the RAF operated alongside the Fleet Air Arm. During the war, RAF aircraft were deployed in the mid-Atlantic at RAF Ascension Island and a detachment from No. 1 Squadron was deployed with the Royal Navy, operating from the aircraft carrier HMS Hermes. RAF pilots also flew missions using the Royal Navy's Sea Harriers in the air-to-air combat role, in particular Flt Lt Dave Morgan the highest scoring pilot of the war. Following a British victory, the RAF remained in the South Atlantic to provide air defence to the Falkland Islands, based at RAF Mount Pleasant (built 1984). With the end of the Cold War and the collapse of the Soviet Union, the RAF's focus has returned to delivering expeditionary air power. Since 1990 the RAF has been involved in several large-scale operations, including: the 1991 Gulf War, the 1999 Kosovo War, the 2001 War in Afghanistan, the 2003 invasion and war in Iraq and the 2011 intervention in Libya. The RAF's 90th anniversary was commemorated on 1 April 2008 by a flypast of 9 Red Arrows and four Typhoons along the Thames, in a straight line from just south of London City Airport Tower Bridge, the London Eye, the RAF Memorial and (at 13.00) the Ministry of Defence building. Four major defence reviews have been conducted since the end of the Cold War: the 1990 Options for Change, the 1998 Strategic Defence Review, the 2003 Delivering Security in a Changing World and the 2010 Strategic Defence and Security Review. All four defence reviews have resulted in steady reductions in manpower and numbers of aircraft, especially combat aircraft such as fast-jets. As part of the latest 2010 Strategic Defence and Security Review, the BAE Systems Nimrod MRA4 maritime patrol aircraft was cancelled due to over spending and missing deadlines. Other reductions saw total RAF manpower reduced by 5,000 personnel to a trained strength of 33,000 and the early retirement of the Joint Force Harrier aircraft, the Harrier GR7/GR9. A Typhoon on QRA intercepts a Russian Tupolev Tu-95 bomber approaching UK airspace. 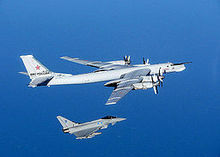 In recent years fighter aircraft on Quick Reaction Alert (QRA) have been increasingly required to scramble in response to efforts made by the Russian Air Force to approach British airspace. 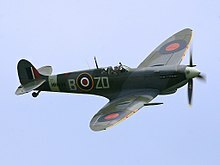 On 24 January 2014 in the Houses of Parliament, Conservative MP and Minister of State for the Armed Forces, Andrew Robathan, announced that the RAF's QRA force had been scrambled almost thirty times in the last three years: eleven times during 2010, ten times during 2011 and eight times during 2012. RAF Coningsby in Lincolnshire and RAF Lossiemouth in Moray both provide Quick Reaction Alert, or QRA, and scramble their fighter jets within minutes to meet or intercept aircraft which give cause for concern. Lossiemouth generally covers the northern sector, while Coningsby provides QRA in the south. Typhoon pilot Flight Lieutenant Noel Rees describes how QRA duty works. "At the start of the scaled QRA response, civilian air traffic controllers might see on their screens an aircraft behaving erratically, not responding to their radio calls, or note that it's transmitting a distress signal through its transponder. Rather than scramble Typhoons at the first hint of something abnormal, a controller has the option to put them on a higher level of alert, ‘a call to cockpit’. In this scenario the pilot races to the hardened aircraft shelter and does everything short of starting his engines". On 4 October 2015, a final stand-down saw the end of more than 70 years of RAF Search and Rescue provision in the UK. The RAF and Royal Navy's Westland Sea King fleets, after over 30 years of service, were retired. A civilian contractor, Bristow Helicopters, took over responsibility for UK Search and Rescue, under a Private Finance Initiative with newly purchased Sikorsky S-92 and AgustaWestland AW189 aircraft. The new contract means that all UK SAR coverage is now provided by Bristow aircraft. In 2018 the RAF's vision of a future constellation of imagery satellites was initiated through the launch of the Carbonite-2 technology demonstrator. The 100 kg Carbonite-2 uses commercial off-the-shelf (COTS) components to deliver high-quality imagery and 3D video footage from space. The professional head of the RAF is the Chief of the Air Staff (CAS). The CAS heads the Air Force Board, which is a committee of the Defence Council. The Air Force Board is the management board of the RAF and consists of several high-ranking officers. Authority is delegated from the Air Force Board to the RAF's commands. While there were once individual commands responsible for bombers, fighters, training, etc., now only the Air Command exists, headquartered at RAF High Wycombe. As this command is headed by the Chief of the Air Staff himself, it does not operate in way previous commands did with their own separate Air Officers Commanding and staff remote from Whitehall. No. 1 Group (Air Combat): controls the fast-jet force and the RAF's intelligence, surveillance, target acquisition, and reconnaissance (ISTAR) capabilities, as well as the following stations: RAF Coningsby, RAF Lossiemouth, RAF Marham, and RAF Waddington. No. 2 Group (Air Combat Support): controls the Air Mobility aircraft and the RAF's Force Protection assets as well as the following stations: RAF Benson, RAF Brize Norton, RAF Odiham and RAF Northolt. No. 11 Group (Multi-domain operations group): will lead air and space operations and command of the following air stations: RAF Boulmer, RAF Fylingdales, RAF Scampton, RAF Spadeadam. No. 22 Group (Training): responsible for the supply of qualified and skilled personnel, as well as the following stations: RAF College Cranwell, RAF Cosford, RAF Halton, RAF Linton-on-Ouse, RAF Shawbury, MOD St Athan, RAF St Mawgan and RAF Valley. No. 38 Group (Air Combat Service Support): responsible for engineering and logistics, communications and medical operations, as well as the following stations: RAF High Wycombe and RAF Wittering. No. 83 Group (Expeditionary Air): the RAF's operational headquarters in the Middle East, responsible for UK air operations in the Operations KIPION and SHADER Joint Operating Areas (JOAs) of some eight million square miles. Phased Array Ballistic Missile Early Warning System at RAF Fylingdales. A flying squadron is an aircraft unit which carries out the primary tasks of the RAF. RAF squadrons are somewhat analogous to the regiments of the British Army in that they have histories and traditions going back to their formation, regardless of where they are based, which aircraft they are operating, etc. They can be awarded standards and battle honours for meritorious service. Whilst every squadron is different, most flying squadrons are commanded by a wing commander and, for a fast-jet squadron, have an establishment of around 12 aircraft. The RAF Schools consist of the squadrons and support apparatus that train new aircrew to join front-line squadrons. The schools separate individual streams, but group together units with similar responsibility or that operate the same aircraft type. Some schools operate with only one Squadron, and have an overall training throughput which is relatively small; some, like 3 FTS, have responsibility for all Elementary Flying Training (EFT) in the RAF, and all RAF aircrew will pass through its squadrons when they start their flying careers. 2 FTS and 6 FTS do not have a front-line training responsibility – their job is to group the University Air Squadrons and the Volunteer Gliding Squadrons together. 2 FTS's commanding officer holds the only full-time flying appointment for a Group Captain in the RAF, although he is a reservist. Central Flying School – CFS standardises flying training across the air force and ensures standards and safety are maintained. No. 3 Flying Training School – Elementary Flying Training, based at RAFC Cranwell with a squadron at RAF Wittering. Defence Helicopter Flying School – Basic helicopter training, based at RAF Shawbury. Defence College of Technical Training – Several different specialist areas: aeronautical engineering, electro and mechanical engineering, and communication and information systems. Royal Naval Air Engineering and Survival Equipment School. Defence School of Marine Engineering. A flight is a sub-division of a squadron. Flying squadrons are often divided into two flights, e.g., "A" and "B", each under the command of a squadron leader. Administrative squadrons on a station are also divided into flights and these flights are commanded by a junior officer, often a flight lieutenant. Because of their small size, there are several flying units formed as flights rather than squadrons. For example, No. 1435 Flight is based at RAF Mount Pleasant in the Falkland Islands, maintaining air defence cover with four Eurofighter Typhoon aircraft. At its height in 1944 during the Second World War, more than 1,100,000 personnel were serving in the RAF. The longest-lived founding member of the RAF was Henry Allingham, who died on 18 July 2009 aged 113. As of 1 January 2015, the Royal Air Force numbered some 34,200 Regular and 1,940 Royal Auxiliary Air Force personnel, giving a combined component strength of 36,140 personnel. In addition to the active elements of the Royal Air Force, (Regular and Royal Auxiliary Air Force), all ex-Regular personnel remain liable to be recalled for duty in a time of need, this is known as the Regular Reserve. In 2007 there were 33,980 Regular Reserves of the Royal Air Force, of which 7,950 served under a fixed-term reserve contract. Publications since April 2013 no-longer report the entire strength of the Regular Reserve, instead they only give a figure for Regular Reserves who serve under a fixed-term reserve contract. They had a strength of 7,120 personnel in 2014. Figures provided by the International Institute for Strategic Studies from 2012 showed that Royal Air Force pilots achieve a relatively high number of flying hours per year when compared with other major NATO allies such as France and Germany. RAF pilots achieve 210 to 290 flying hours per year. French and German Air Force pilots achieved only 180 and 150 flying hours across their fleets respectively. Officers hold a commission from the Sovereign, which provides the legal authority for them to issue orders to subordinates. The commission of a regular officer is granted after successfully completing the 24-week-long Initial Officer Training course at the RAF College, Cranwell, Lincolnshire. To emphasize the merger of both military and naval aviation when the RAF was formed, many of the titles of officers were deliberately chosen to be of a naval character, such as flight lieutenant, wing commander, group captain, and air commodore. Other ranks attend the Recruit Training Squadron at RAF Halton for basic training. The titles and insignia of other ranks in the RAF were based on that of the Army, with some alterations in terminology. Over the years, this structure has seen significant changes: for example, there was once a separate system for those in technical trades, and the ranks of chief technician and junior technician continue to be held only by personnel in technical trades. RAF other ranks fall into four categories: Warrant Officers, Senior Non-Commissioned Officers, Junior Non-Commissioned Officers and Airmen. All Warrant Officers in the RAF are equal in terms of rank, but the most senior Non-Commissioned appointment is known as the Chief of the Air Staff's Warrant Officer. The Royal Air Force operates several units and centres for the provision of non-generic training and education. These include the Royal Air Force Leadership Centre and the Royal Air Force Centre for Air Power Studies, both based at RAF Cranwell, and the Air Warfare Centre, based at RAF Waddington and RAF Cranwell. NCO training and developmental courses occur at RAF Halton and officer courses occur at the Joint Services Command and Staff College at Shrivenham. Typhoon: The Eurofighter Typhoon FGR4 is the RAF's primary multi role air defence and ground attack fighter aircraft, with a total of six squadrons based across RAF Coningsby and RAF Lossiemouth, following the retirement of the Panavia Tornado F3 in late March 2011. Their task is to defend UK airspace. In October 2007 it was announced that MoD Boscombe Down, RNAS Culdrose and RAF Marham would also be used as Quick Reaction Alert bases from early 2008, offering around-the-clock fighter coverage for the South and South West of UK airspace when a direct threat has been identified. With the retirement of the Panavia Tornado GR4 on 1 April 2019, the Typhoon FGR4 took over the Tornados duties after undergoing the 'Project Centurion' upgrades. The RAF has nine front-line Typhoon units; No. 3 (Fighter) Squadron, No. XI (F) Squadron, No. 12 (Bomber) Squadron (joint RAF/Qatar Air Force squadron), No. 29 Squadron (Operational Conversion Unit) and No. 41 Test and Evaluation Squadron based at RAF Coningsby, with No. 1 (F) Squadron, No. II (Army Cooperation) Squadron, No. 6 Squadron and No. IX (B) Squadron based at RAF Lossiemouth. On 23 November 2015, it was announced that two additional front-line Typhoon squadrons will be formed consisting of Tranche 1 versions. Lightning: On 23 November 2015, it was announced that a total of 138 Lockheed Martin F-35B Lightning IIs will be ordered. Known only as the Lightning in British service, the first RAF squadron to operate the F-35 was No. 17 Test and Evaluation Squadron at Edwards AFB, California, accepting its first F-35B in 2014.No. 617 (The Dambusters) Squadron officially reformed on 18 April 2018 as an RAF Lightning Squadron. The first four aircraft arrived at RAF Marham in June 2018, with a further five arriving in August 2018. The planes were declared combat ready in January 2019. The second UK based F-35 squadron to be formed will be No. 207 Squadron on 1 July 2019 as the OCU for both RAF and Royal Navy pilots. The Sentry AEW1, based at RAF Waddington, provides airborne early warning to detect incoming enemy aircraft and to co-ordinate the aerial battlefield. The UK Government's announcement of the procurement of five E-7 Wedgetails in March 2019 led to the withdrawal of two Sentry AEW1s in preparation for the future transition to the new type, bringing the fleet down to four aircraft. The Sentinel R1 (formally known as ASTOR – Airborne STand-Off Radar) provides a ground radar-surveillance platform based on the Bombardier Global Express long range business jet. These were supplemented in 2009 by four (a fifth was added later) Beechcraft Shadow R1 aircraft equipped for the ISTAR role over Afghanistan. Three more Shadow aircraft will be procured as per the 2015 Defence Review. The Tornado GR4A is fitted with cameras and sensors in the visual, infra-red and radar ranges of the spectrum. Ten MQ-9A Reaper Unmanned aerial vehicles have been purchased to support operations in Iraq and Afghanistan. They are operated by No. 39 Squadron based at Creech Air Force Base and No. XIII Squadron at RAF Waddington. Three RC-135W Rivet Joint replaced the Nimrod R1 fleet in the signals intelligence role under the AIRSEEKER Programme. The Nimrod fleet was retired in 2011, the RAF co-manned aircraft of the US Air Force until the three RC-135s entered service between 2014 and 2017. The aircraft will be Boeing KC-135 Stratotanker tankers converted to RC-135W standard in the most complex combined Foreign Military Sales case and co-operative support arrangement that the UK has undertaken with the United States Air Force since the Second World War. Airseeker received its first operational deployment in August 2014, when it was deployed to the Middle East to fly missions over Iraq and Syria as part of Operation Shader. An important part of the work of the RAF is to support the British Army by ferrying troops and equipment at the battlefield. However, RAF helicopters are also used in a variety of other roles, including support of RAF ground units and heavy-lift support for the Royal Marines. The support helicopters are organised into the tri-service Joint Helicopter Command (JHC), along with helicopters of the British Army and Royal Navy. The large twin-rotor Boeing Chinook, based at RAF Odiham provides heavy-lift support and is supported by the Westland Puma HC2 medium-lift helicopter based at RAF Benson. The Bell Griffin HAR.2s based at RAF Akrotiri in the Cyprus Sovereign Base Areas, the only remaining dedicated helicopter Search and Rescue force in the RAF. However, all UK military helicopter aircrew routinely train and practice the skills necessary for Search and Rescue, and the support helicopters based in the UK are available to the Government under Military Aid to the Civil Authorities in case they are needed. The AgustaWestland AW109 Grand New aircraft of No. 32 (the Royal) Squadron also provide VIP transport and military helicopter capabilities. The RAF operate the Boeing C-17 Globemaster III in the heavy strategic airlift role, originally leasing four from Boeing. These were purchased, followed by a fifth delivered on 7 April 2008 and a sixth delivered on 8 June 2008. The new aircraft entered frontline use within days rather than weeks. The MoD said there was "a stated departmental requirement for eight" C-17s and a seventh was subsequently ordered, to be delivered in December 2010. In February 2012 the purchase of an eighth C-17 was confirmed; the aircraft arrived at RAF Brize Norton in May 2012. More routine strategic airlift transport tasks are carried out by the Airbus A330 MRTT, known as the Voyager in RAF service. The first Voyager arrived in the UK for testing at MoD Boscombe Down in April 2011, and entered service in April 2012. The Voyager received approval from the MoD on 16 May 2013 to begin air-to-air refuelling flights and made its first operational tanker flight on 20 May 2013 as part of a training sortie with Tornado GR4s. By 21 May 2013, the Voyager fleet had carried over 50,000 passengers and carried over 3,000 tons of cargo. A total of 14 Voyagers are due to form the fleet, with 9 allocated to sole RAF use. As the Voyagers lack a refueling boom, the RAF has requested a memorandum of understanding (MoU) with the USAF allowing the UK access to tankers equipped with refueling booms for its Boeing RC-135W Airseeker SIGINT aircraft. Shorter range, tactical-airlift transport is provided by the Lockheed Martin C-130J Hercules, known as Hercules C4 and C5 in RAF service and based at RAF Brize Norton in Oxfordshire. The draw-down of the Hercules C5 fleet has begun with the final aircraft planned to retire in 2019.The fourteen C4 extended variants are scheduled to retire on 31 March 2035. The Airbus A400M Atlas replaced the RAF's fleet of Hercules C1/C3 (C-130K) transport aircraft which were withdrawn from service on 31 December 2012 and will also replace the C4/C5 variants. Originally, 25 aircraft were ordered, although the total is now 22. No. 32 (The Royal) Squadron replaced the Queen's Flight in 1995 and operate the Agusta A109 and BAe 146 CC2 in the general air transport and VIP transport roles. The squadron is based at RAF Northolt in west London. Aircraft operate with a priority for military needs over VIP transport. Two additional BAe 146s were purchased in March 2012 from TNT Airways and were refitted by Hawker Beechcraft on behalf of BAE Systems for tactical freight and personnel transport use. The aircraft, designated as the BAe 146 C Mk 3, arrived in Afghanistan in April 2013. Elementary Flying Training, as well as Multi-Engine Lead-In training, is conducted on the Grob Tutor T1. Basic fast jet training is provided on the Short Tucano T1 and initial helicopter training on the Squirrel HT1, at which stage aircrew gain their 'wings'. Multi-Engine aircrew, weapon systems officer (WSO) and weapon systems operator (WSOp) students are trained on the King Air to gain their wings before a posting to an Operational Conversion Unit. Advanced jet flying training is now provided on BAe Hawk T2 for fast jet aircrew and helicopter pilots complete a course on the Bell Griffin HT1, before they are sent to their OCU, which trains them on a specific aircraft type in preparation for service with a front-line squadron. The OCUs use modified operational aircraft, such as the Typhoon T3, as well as sophisticated simulators and ground training. The Tutor equips the fourteen University Air Squadrons, which provide University students an opportunity to undertake an RAF training syllabus based loosely on EFT to get them to and beyond solo standard. These units are co-located with Air Experience Flights, which share the same aircraft and facilities and provide air experience flying to the Air Training Corps and CCF. The Volunteer Gliding Squadrons also provide air experience flying to cadets using the Grob Viking T1 conventional glider. Due to an airworthiness issue in April 2014, the Viking fleet and the Grob Vigilant T1 aircraft were grounded for a two-year period, although Viking operations have subsequently resumed. The Vigilant was unexpectedly withdrawn from service in May 2018, a year earlier than planned. A contract tender was initiated in February 2018 to replace this capability starting in 2022. Two of the ten T-6 Texan II trainers due as part of the UK Military Flight Training System were delivered in February 2018, forming the nucleus of the unit to be operated at RAF Valley. The aircraft are jointly operated by the Royal Air Force and Ascent Flight Training to provide lead-in training for RAF and Royal Navy fighter pilots prior to advanced training on the Hawk. No. 100 Squadron operates the BAe Hawk T1 to support other fast jets and in support of ground unit training, as an aggressor aircraft. The Squadron fulfils the role of enemy aircraft in air combat training or to provide more assets in joint exercises. The F-35B Lightning II is intended to enter service around 2020 under the Joint Combat Aircraft programme. On 19 July 2012 the Defence Secretary, Philip Hammond, in a speech in the US, indicated that the UK would initially receive 48 F-35B to equip the Navy's carrier fleet and would announce at a later date what the final numbers would be. Jon Thompson, MOD Permanent Secretary, told the House of Commons Defence Select Committee, in late 2012: "Our commitment over the first 10 years is for 48 F-35B". An order for the first 14 aircraft on top of the four already procured for operational test and evaluation is expected later in 2013. The first four of 14 production aircraft were ordered in November 2014. Six further aircraft were ordered on 3 November 2015, with expected delivery in 2016. In November 2015, the government commitment to order 48 F-35B aircraft by 2023, 24 of which will be available for carrier duties. The 2015 Strategic Defence and Security Review stated the intent for the UK to purchase 138 F-35 aircraft over the life of the programme. The first F-35 aircraft arrived at RAF Fairford in Gloucestershire on 29 June 2016 after a Transatlantic crossing involving air to air refuelling. On 5 October 2015, it was announced that the Scavenger programme had been replaced by "Protector", a new requirement for at least 20 systems. On 7 October 2015, it was revealed that Protector will be a Certifiable derivative of the MQ-9B SkyGuardian with enhanced range and endurance. In July 2018, a General Atomics US Civil registered MQ-9B SkyGuardian was flown from North Dakota to RAF Fairford for the Royal International Air Tattoo where it was given RAF markings. It was formally announced by the Chief of Air Staff that No. 31 Squadron would become the first squadron to operate the Protector RG1. In July 2014 the House of Common Defence Select Committee released a report on the RAF future force structure that envisaged a mixture of unmanned and manned platforms, including further F-35, Protector RG1, a service life extension for the Typhoon (which would otherwise end its service in 2030) or a possible new manned aircraft. In November 2015, the Government confirmed in its Strategic Defence and Security Review that nine Boeing P-8 Poseidon aircraft will be purchased for surveillance, anti-submarine and anti-surface ship warfare, filling a capability gap in maritime patrol that had been left since the cancellation of the Nimrod MRA4 programme in the 2010 SDSR. It was announced on 20 August 2018 that the Boeing P-8A will be known as the Poseidon MRA1 in RAF service. In July 2018 at the Farnborough Airshow, the Defence Secretary announced a £2bn investment for BAe Systems, MBDA and Leonardo to develop a new British 6th Generation Fighter to replace Typhoon in 2035 under Project TEMPEST. On 22 March 2019, the Defence Secretary announced the United Kingdom had signed a $1.98 billion deal to procure five Boeing E-7 Wedgetails to replace the ageing E-3D Sentry AEW1 fleet in the Airborne Early Warning and Control (AEW&C) role, with deliveries expected to take place in the early 2020s. The UK's military flying training has been civilianised through a public-private partnership, which puts training output in the hands of a civilian contractor, known as Ascent Flight Training, a consortium of Lockheed Martin and Babcock International. The main elements of the system are fixed- and rotary-wing training from ab-initio all the way to Operational Conversion Units, which prepare aircrew for a specific frontline platform. The new process uses three new fixed wing aircraft, the Grob 'Prefect' elementary trainer, the Beechcraft T-6 Texan II basic fast jet trainer, and the Embraer Phenom 100 multi-engine trainer. The aircraft have been procured to reduce the training gap between the older generation Tutor T1, Tucano T1 and King Air T1 aircraft, and the RAF's modern frontline aircraft, including advanced systems and glass cockpits. MFTS also relies far more on synthetic training to deliver aircrew to the front line, where advanced synthetic training is commonplace. Basic Fast Jet training is undertaken on the Texan, and advanced training is done on the BAE Systems Hawk T2, the contract for which had been separated from the rest of the UK MFTS contract, under the auspices of the Advanced Fast Jet Trainer programme. In May 2016, it was announced that the RAF would see delivery of 29 Airbus H135 and 3 Airbus H145 helicopters for use as training aircraft. It was announced by Air Marshal Sean Reynolds, the Senior Responsible Owner for UKMFTS, that "Aircrew across the three Services will continue to conduct their basic and advanced rotary training at RAF Shawbury and Army Air Corps Middle Wallop. Aircrew selected for training in mountain and maritime helicopter operations will receive instruction at RAF Valley". Following the tradition of the other British fighting services, the RAF has adopted symbols to represent it, use as rallying devices for members and promote esprit de corps. British aircraft in the early stages of the First World War carried the Union Flag as an identifying feature; however, this was easily confused with Germany's Iron Cross motif. In October 1914, therefore, the French system of three concentric rings was adopted, with the colours reversed to a red disc surrounded by a white ring and an outer blue ring. The relative sizes of the rings have changed over the years and during World War II an outer yellow ring was added to the fuselage roundel. Aircraft serving in the Far East during World War II had the red disc removed to prevent confusion with Japanese aircraft. Since the 1970s, camouflaged aircraft carry low-visibility roundels, either red and blue on dark camouflage, or washed-out pink and light blue on light colours. Most uncamouflaged training and transport aircraft retain the traditional red-white-blue roundel. The Latin motto of the RAF, "Per ardua ad astra", is usually translated as "Through Adversity to the Stars", but the RAF's official translation is "Through Struggle to the Stars". The choice of motto is attributed to a junior officer named J S Yule, in response to a request from a commander of the RFC, Colonel Sykes, for suggestions. The Badge of the Royal Air Force was first used in August 1918. In heraldic terms it is: "In front of a circle inscribed with the motto Per Ardua Ad Astra and ensigned by the Imperial Crown an eagle volant and affronte Head lowered and to the sinister". Although there have been debates among airmen over the years whether the bird was originally meant to be an albatross or an eagle, the consensus is that it was always an eagle. The Red Arrows in formation with an F-35B and a pair of Typhoons at the Royal International Air Tattoo in 2016. The Red Arrows, officially known as the Royal Air Force Aerobatic Team, is the aerobatics display team of the Royal Air Force based at RAF Scampton, with under-review plans to move to RAF Waddington. The team was formed in late 1964 as an all-RAF team, replacing a number of unofficial teams that had been sponsored by RAF commands. The Red Arrows badge shows the aircraft in their trademark Diamond Nine formation, with the motto Éclat, a French word meaning "brilliance" or "excellence". Initially, they were equipped with seven Folland Gnat trainers inherited from the RAF Yellowjacks display team. This aircraft was chosen because it was less expensive to operate than front-line fighters. In their first season, they flew at 65 shows across Europe. In 1966, the team was increased to nine members, enabling them to develop their Diamond Nine formation. In late 1979, they switched to the BAE Hawk trainer. The Red Arrows have performed over 4,700 displays in 56 countries worldwide. Headquarters Royal Air Force Music Services, located at RAF Northolt, supports professional musicians who attend events around the globe in support of the RAF. The Central Band of the Royal Air Force was established in 1920. Other bands include the Band of the Royal Air Force College, the Band of the Royal Air Force Regiment and the Band of the Royal Auxiliary Air Force. Gibraltar 1940s–present RAF Gibraltar Although there are no permanently stationed aircraft, RAF aircraft (e.g. transports) make regular visits. Cyprus 1940–present RAF Akrotiri As part of British Forces Cyprus, the RAF have aircraft which can be deployed from Cyprus as part of the intervention against ISIL. Qatar 2005–present RAF Al Udeid An RAF RC-135 Rivet Joint aircraft is based at Al Udeid which is currently in use as a Middle Eastern base for the RAF as well as being the headquarters for the RAF contribution to Operation Shader. Afghanistan 2001–present Operation Toral The UK continues to contribute to NATO's Resolute Support Mission with the RAF providing Puma HC2s. Norway 1960s–present Bardufoss Air Station RAF fighter and/or helicopter squadrons undergo winter-training in Norway. Ascension Island 1982–present RAF Ascension Island The island is used as an air bridge between the UK and the Falkland Islands. Falkland Islands 1982–present RAF Mount Pleasant As part of British Forces South Atlantic Islands, the RAF has two Chinook helicopters based at Mount Pleasant, and four Typhoon aircraft in an air defence role. ^ Since April 2013, MoD publications no longer report the entire strength of the Regular Reserve, instead, only Regular Reserves serving under a fixed-term reserve contract are counted. These contracts are similar in nature to the RAuxAF. ^ "Defence Statistics" (PDF). UK Parliament. 26 September 2014. Archived (PDF) from the original on 21 December 2018. Retrieved 28 December 2018. ^ "2018 United Kingdom Military Strength". Global Firepower. Archived from the original on 13 April 2018. Retrieved 12 April 2018. ^ a b c "Frequently Asked Questions". Royal Air Force. 2011. Archived from the original on 10 August 2012. Retrieved 15 August 2012. ^ "RAF Timeline 1918–1929". Royal Air Force. 2011. Archived from the original on 12 August 2012. Retrieved 15 August 2012. ^ a b "World War I". Royal Air Force. 2011. Archived from the original on 13 August 2012. Retrieved 15 August 2012. ^ Air Power and Colonial Control: The Royal Air Force, 1919–1939 Archived 1 January 2016 at the Wayback Machine By David E. Omissi, Published 1 January 1990, Retrieved 1 February 2014. Page 8. ^ "Role of the RAF". Royal Air Force. 2011. Archived from the original on 10 August 2012. Retrieved 15 August 2012. ^ "Role of Air Power". Royal Air Force. 2011. Archived from the original on 10 August 2012. Retrieved 15 August 2012. ^ Nick Harvey, Minister of State for the Armed Forces (31 January 2012). "Military Aircraft". Parliamentary Debates (Hansard). House of Commons. Archived from the original on 17 September 2017. Retrieved 14 April 2019. ^ Dickens, Peter. "The Royal Air Force's 100th Birthday and its founder – Jan Smuts | The Observation Post". Samilhistory.com. Archived from the original on 7 July 2018. Retrieved 13 July 2018. ^ "History of Fleet Air Arm Officers Association, FAAOA". Archived from the original on 18 April 2012. Retrieved 22 May 2016. ^ "RCAF.com : Archives : RCAF History : The War Years". 21 May 2006. Archived from the original on 21 May 2006. Retrieved 22 July 2017. ^ "Explore: 'The Angry Sky'". ww2australia.gov.au. Archived from the original on 11 July 2009. Retrieved 29 October 2015. ^ "The Few". The Churchill Centre. Archived from the original on 17 March 2012. Retrieved 29 April 2011. The gratitude of every home in our island, in our Empire, and indeed throughout the world, except in the abodes of the guilty, goes out to the British airmen who, undaunted by odds, unwearied in their constant challenge and mortal danger, are turning the tide of the world war by their prowess and by their devotion. Never in the field of human conflict was so much owed by so many to so few. ^ "Attack on Amiens Prison, 18th February 1944". RAF. 2004. Archived from the original on 1 January 2007. Retrieved 1 January 2007. ^ "RAF Timeline 1945–1949". Royal Air Force. 2011. Archived from the original on 12 August 2012. Retrieved 15 August 2012. ^ "RAF Timeline 1960–1969". Royal Air Force. 2011. Archived from the original on 12 August 2012. Retrieved 15 August 2012. ^ Burnell, Brian. "Weapon detail and No.15 Squadron data for 1984." Archived 10 October 2017 at the Wayback Machine nuclear-weapons.info. Retrieved 19 January 2011. ^ "Operation Firedog : air support in the Malayan Emergency, 1948–1960". Imperial war Museum. Archived from the original on 31 December 2017. Retrieved 31 December 2017. ^ "Seletar's Sunderlands". RAF Seletar. Archived from the original on 14 June 2018. Retrieved 31 December 2017. ^ "Flight Lieutenant Jack Sherburn: Pilot awarded a DFC for his gallantry against the Mau Mau who went on to serve in Suez and fly with Yuri Gagarin". The Independent. 20 August 2014. Archived from the original on 1 January 2018. Retrieved 31 December 2017. ^ "Suez Crisis". Britain's small wars. Archived from the original on 5 February 2009. Retrieved 31 December 2017. ^ "Confrontation Ends". Straits Times. 12 August 1966. Archived from the original on 31 December 2017. Retrieved 31 December 2017. ^ Evans 1998, pp. 74–75. ^ "Argentine Aircraft Lost – Falklands War 1982". Naval-history.net. 15 June 1982. Archived from the original on 29 May 2009. Retrieved 23 March 2010. ^ "RAF Typhoons arrive for Falkland Islands mission – 9/22/2009". Flight Global. 22 September 2009. Archived from the original on 26 December 2010. Retrieved 19 August 2014. ^ "Gulf War 25th anniversary special: a quick look at the RAF Tornado's reconnaissance missions over Iraq". Aviationist. 17 January 2016. Archived from the original on 31 December 2017. Retrieved 31 December 2017. ^ "RAF 'nearly ran out of bombs' in Kosovo". The Guardian. 25 April 2000. Archived from the original on 31 December 2017. Retrieved 31 December 2017. ^ Tornados Bound for Kandahar, Air Forces Monthly, August 2008 issue, p. 8. ^ "903 Expeditionary Air Wing". Royal Air Force (RAF). Archived from the original on 18 March 2015. Retrieved 21 October 2014. ^ "MOD rushes new transport plane into service for operations". The Telegraph. 22 April 2011. Archived from the original on 1 January 2018. Retrieved 31 December 2017. ^ "90th Anniversary Flypast in London". RAF News Archives. 1 April 2008. Archived from the original on 16 October 2015. Retrieved 30 October 2015. 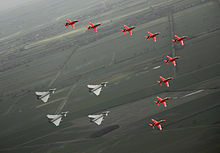 ^ "Flypast marks RAF's anniversary". BBC News. Archived from the original on 6 April 2008. Retrieved 29 October 2015. ^ Wilkinson, Tom (24 November 2010). "Last Harrier jet leaves Ark Royal". Independent. UK. Archived from the original on 27 November 2010. Retrieved 4 December 2010. ^ "MoD image description". mod.uk. Archived from the original on 16 October 2015. Retrieved 29 October 2015. ^ "Farewell to RAF UK Search & Rescue". raf.mod.uk. Archived from the original on 8 December 2015. Retrieved 3 November 2015. ^ Allison, George (1 March 2018). "Royal Air Force surveillance satellite launched into space". UK Defence Journal. Archived from the original on 3 March 2018. Retrieved 2 March 2018. ^ Corfield, Gareth (1 March 2018). "Brit military boffins buy airtime on HD eye-in-the-sky video satellite". The Register. Archived from the original on 1 March 2018. Retrieved 2 March 2018. ^ "Chief of the Air Staff (CAS) Sir Stephen Hillier". Royal Air Force. Archived from the original on 3 June 2016. Retrieved 12 June 2016. ^ "RAF Command and Organisation". Armed Forces. 2015. Archived from the original on 13 May 2015. Retrieved 26 April 2015. ^ "RAF Command". Royal Air Force. Archived from the original on 12 August 2012. Retrieved 15 August 2012. ^ Bowyer, Richard. "Dictionary of Military Terms". p. 6. Archived from the original on 28 March 2017. Retrieved 8 May 2018. ^ "No. 1 Group". RAF. Archived from the original on 14 June 2018. Retrieved 31 December 2017. ^ "No. 2 Group". RAF. Archived from the original on 14 June 2018. Retrieved 31 December 2017. ^ "No. 11 Group". RAF. Archived from the original on 6 November 2018. Retrieved 8 November 2018. ^ "No. 22 Group". RAF. Archived from the original on 14 June 2018. Retrieved 31 December 2017. ^ "No. 38 Group". RAF. Archived from the original on 14 June 2018. Retrieved 31 December 2017. ^ "No. 83 Expeditionary Air Group". RAF. Archived from the original on 24 February 2018. Retrieved 23 February 2018. ^ a b "RAF Station organisation". Armed forces. Archived from the original on 24 August 2017. Retrieved 31 December 2017. ^ "Number 34 Expeditionary Air Wing". RAF. Archived from the original on 1 January 2018. Retrieved 31 December 2017. ^ "A Special Thank You For RAF Personnel Involved in Op Ruman". Forces Network. 27 October 2017. Archived from the original on 2 January 2018. Retrieved 1 January 2018. ^ a b c d "RAF Mareham". RAF. Archived from the original on 31 July 2017. Retrieved 31 December 2017. ^ "Number 901 Expeditionary Air Wing". RAF. Archived from the original on 3 July 2017. Retrieved 31 December 2017. ^ "Number 902 Expeditionary Air Wing". RAF. Archived from the original on 3 July 2017. Retrieved 31 December 2017. ^ "Number 903 Expeditionary Air Wing". RAF. Archived from the original on 3 July 2017. Retrieved 31 December 2017. ^ "Number 906 Expeditionary Air Wing". RAF. Archived from the original on 3 July 2017. Retrieved 31 December 2017. ^ "Robert Smith-Barry: The man who taught the world to fly". BBC. 23 February 2013. Archived from the original on 24 October 2018. Retrieved 31 December 2017. ^ Harris, R (27 October 2007). "Military pilot training academy prepares to celebrate its 50th year". The Press. Newsquest Media Group. Retrieved 27 October 2007. ^ "New Gliding School Launches for Air Cadets". Air Cadets. Archived from the original on 15 February 2014. Retrieved 14 December 2014. ^ "RAF Cranwell". Royal Air Force. Archived from the original on 24 September 2015. Retrieved 23 November 2014. ^ "4 FTS History". Royal Air Force. Archived from the original on 22 July 2013. Retrieved 15 December 2015. ^ "6 Flying Training School". RAF.mod.uk. Archived from the original on 12 October 2015. Retrieved 8 October 2015. ^ "Elementary Flying Training". Royal Navy. Archived from the original on 1 January 2018. Retrieved 31 December 2017. ^ "Welcome to RAF Shawbury". RAF. Archived from the original on 17 October 2017. Retrieved 31 December 2017. ^ "Defence College of Technical Training". RAF. Archived from the original on 30 July 2017. Retrieved 29 July 2017. ^ "RAF – Defence College of Technical Training". www.raf.mod.uk. Archived from the original on 4 February 2017. Retrieved 29 December 2016. ^ here, RAF Details. "RAF – DSAE". www.raf.mod.uk. Archived from the original on 30 July 2017. Retrieved 29 July 2017. ^ here, RAF Details. "RAF – DSEME". www.raf.mod.uk. Archived from the original on 30 July 2017. Retrieved 29 July 2017. ^ here, RAF Details. "RAF – DSCIS". www.raf.mod.uk. Archived from the original on 30 July 2017. Retrieved 29 July 2017. ^ "History of 1435 Squadron". MOD. Archived from the original on 22 December 2015. ^ "Fly-past for Britain's oldest man". BBC News. 3 June 2006. Archived from the original on 30 April 2009. Retrieved 20 April 2011. ^ gov.uk MoD – regular personnel Archived 2 April 2015 at the Wayback Machine, table 2-page 8. 1 January 2015. ^ gov.uk MoD – quarterly personnel report Archived 21 April 2016 at the Wayback Machine, table 4-page 9. 1 January 2015. ^ dasa.mod – reserves and cadet strengths Archived 3 December 2013 at the Wayback Machine, table 4-page 6. April 2012. ^ gov.uk MoD – reserves and cadet strengths Archived 8 March 2016 at the Wayback Machine, table 4-page 13. See note 2. April 2014. ^ gov.uk MoD – reserves and cadet strengths Archived 8 March 2016 at the Wayback Machine, table 4-page 13. April 2014. ^ "RAF IOT Breakdown" (PDF). 9 August 2016. Archived (PDF) from the original on 22 October 2016. Retrieved 22 October 2016. ^ "Commissioned ranks of the Royal Air Force 1919–present". Air of Authority – A history of RAF Organisation. Archived from the original on 31 December 2017. Retrieved 31 December 2017. ^ "Recruit training". RAF. Archived from the original on 1 January 2018. Retrieved 31 December 2017. ^ "Chief of the Air Staff's Warrant Officer". Royal Air Force. 2011. Archived from the original on 12 August 2012. Retrieved 15 August 2012. ^ "Royal Air Force Centre for Air Power Studies". Air Power Studies. Archived from the original on 1 January 2018. Retrieved 31 December 2017. ^ "Air Warfare Centre". armedforces.co.uk. Archived from the original on 10 February 2012. Retrieved 5 January 2012. ^ "Defence Review: inside the college that trains the top brass". Telegraph. 16 September 2010. Archived from the original on 1 January 2018. Retrieved 31 December 2017. ^ a b "Typhoon FGR4". Royal Air Force. Archived from the original on 10 August 2012. Retrieved 15 August 2012. ^ Jennings, Gareth (22 September 2014). "RAF Lossiemouth undertakes first QRA North scramble". IHS Jane's Defence Weekly. Archived from the original on 1 February 2015. ^ Hoyle, Craig (8 November 2018). "The UK Royal Air Force is advancing with preparations to mark the departure from service of its last Panavia Tornado GR4 strike aircraft next March". Flight Global. Archived from the original on 24 January 2019. Retrieved 14 March 2019. ^ Lake, Jon (4 February 2019). "RAF Typhoons replace Tornados in Operation 'Shader' armed with Brimstone for first time". Jane's 360. Archived from the original on 7 February 2019. Retrieved 14 March 2019. ^ Jennings, Gareth (6 July 2018). "RAF receives first 'Centurion' Typhoons ahead of Tornado retirement". Jane's 360. Archived from the original on 1 March 2019. Retrieved 1 April 2019. ^ "Typhoon aircraft relocate to RAF Lossiemouth". www.gov.uk. Archived from the original on 24 November 2015. Retrieved 29 October 2015. ^ "UK Tornado fleet to retire in 2019, says BAE". Flightglobal.com. 2 August 2012. Archived from the original on 19 August 2012. Retrieved 4 November 2012. ^ "BBC News – RAF Marham base for Joint Strike Fighter". Bbc.co.uk. 25 March 2013. Archived from the original on 28 May 2013. Retrieved 8 July 2013. ^ tweet_btn(), Gareth Corfield 19 May 2017 at 14:44. "Blighty's buying another 17 F-35s, confirms the American government". Archived from the original on 6 August 2017. Retrieved 22 July 2017. ^ "F-35B Lightning". Royal Air Force. Archived from the original on 22 March 2019. Retrieved 1 April 2019. ^ "17(R) Squadron". Royal Air Force. Archived from the original on 28 October 2016. Retrieved 1 April 2019. ^ "RAF's legendary Dambusters squadron reforms to fly F-35 jets | Royal Air Force". Raf.mod.uk. 18 April 2018. Archived from the original on 15 August 2018. Retrieved 15 August 2018. ^ Taz Ali. "F-35 Lightning fighter jets arrive at RAF Marham | Latest Norfolk and Suffolk News – Eastern Daily Press". Edp24.co.uk. Archived from the original on 15 August 2018. Retrieved 15 August 2018. ^ "Further five F-35 fighter jets land at new RAF Marham home". ITN News. Archived from the original on 4 August 2018. Retrieved 4 August 2018. ^ "First F-35 jets ready to battle for Britain". Archived from the original on 11 January 2019. Retrieved 11 January 2019. ^ "Identity of F-35 Lightning Training Squadron Announced". Royal Air Force. 5 July 2017. Archived from the original on 28 July 2017. Retrieved 1 April 2019. ^ "RAF Sentry AEW aircraft deploys in support of counter-IS mission". Flight Global. Archived from the original on 2 February 2015. Retrieved 2 February 2015. ^ a b "WEDGETAIL TO BE RAF'S NEW EARLY WARNING RADAR AIRCRAFT". Royal Air Force. 22 March 2019. Archived from the original on 22 March 2019. Retrieved 22 March 2019. ^ "UK converts King Air 350s into ISTAR platforms". defence-solutions.co.uk. 13 January 2009. Archived from the original on 14 April 2009. Retrieved 16 February 2009. ^ "Tornado GR4A". Royal Air Force. 2011. Archived from the original on 13 August 2012. Retrieved 15 August 2012. ^ "Armed drones operated from RAF base in UK, says MoD". BBC News. 27 April 2013. Archived from the original on 28 April 2013. Retrieved 27 April 2013. ^ "Nimrod R1 aircraft in final flight for RAF". BBC News. 28 June 2011. Archived from the original on 1 July 2011. Retrieved 1 July 2011. ^ Ministry of Defence (22 December 2010). "Rivet Joint joins Future Force 2020". Mod.uk. Archived from the original on 19 October 2012. Retrieved 13 September 2013. ^ "Iraq: 'Secret' Surveillance Flights Revealed". Sky News. 16 November 2014. Archived from the original on 28 January 2015. Retrieved 29 December 2014. ^ "Strategic Defence Review" (PDF). Ministry of Defence. 1 July 1998. Archived (PDF) from the original on 19 April 2016. Retrieved 30 December 2017. ^ Baldwin, Harriett (7 December 2017). "Chinook Helicopters: Written question – 116751". UK Parliament. Archived from the original on 11 December 2017. Retrieved 10 December 2017. ^ "UK MoD receives first upgraded Puma HC Mk2 helicopter". Airforce Technology. 14 September 2012. Archived from the original on 6 July 2015. Retrieved 23 April 2015. ^ "Griffin HAR.2". RAF. Archived from the original on 1 January 2018. Retrieved 31 December 2017. ^ "Agusta A109E". RAF. Archived from the original on 1 January 2018. Retrieved 31 December 2017. ^ Pike, John. "Royal Air Force to Acquire 7th Boeing C-17 Globemaster III". Globalsecurity.org. Archived from the original on 23 December 2009. Retrieved 22 October 2010. ^ "UK to buy eighth C-17 transport". Flight International. 8 February 2012. Archived from the original on 13 February 2012. Retrieved 9 March 2012. ^ "New RAF C-17 aircraft touches down in the UK". Ministry of Defence. 24 May 2012. Archived from the original on 9 March 2014. Retrieved 12 June 2013. ^ "Voyager, biggest plane in RAF history, arrives in UK". BBC News. 19 April 2011. Archived from the original on 20 April 2011. Retrieved 20 April 2011. ^ "Airbus Military's A330 MRTT begins its service career with the UK Royal Air Force". Airbus. 9 April 2012. Archived from the original on 13 November 2013. Retrieved 12 June 2013. ^ Hoyle, Craig (21 May 2013). "RAF Voyager launches tanker operations with Tornado". Flight International. Archived from the original on 9 June 2013. Retrieved 12 June 2013. ^ "RAF, USAF Work on Rivet Joint Refueling Deal". Aviationweek.com. 5 July 2013. Archived from the original on 14 November 2013. Retrieved 13 September 2013. ^ "MOD signs contracts and agreements for new RAF aircraft and weapons". Ministry of Defence. Archived from the original on 2 April 2010. Retrieved 14 April 2010. ^ "Hercules Aircraft:Written question – 4690". UK Parliament. 21 July 2017. Archived from the original on 30 July 2017. Retrieved 30 July 2017. ^ "BAE Systems wins £15.5 million MOD contract for the Royal Air Force". BAE Systems. 21 June 2012. Archived from the original on 4 February 2013. Retrieved 25 June 2012. ^ "BAe 146 C.Mk 3 aircraft delivered to the UK Royal Air Force". BAE Systems. 19 April 2013. Archived from the original on 9 March 2014. Retrieved 12 June 2013. ^ "BAe146 C Mk 3". Royal Air Force. 29 April 2013. Archived from the original on 30 May 2013. Retrieved 12 June 2013. ^ "Operational conversion". RAF. Archived from the original on 1 January 2018. Retrieved 31 December 2017. ^ Brown, David (11 May 2018). "RAF grounds its training gliders over safety fears". The Times (72532). p. 4. ISSN 0140-0460. ^ "Fixed-wing Light Aircraft Training System – Contracts Finder". Contractsfinder.service.gov.uk. Archived from the original on 16 November 2018. Retrieved 26 February 2018. ^ "First T-6C Texan IIs arrive at Valley". Air Forces Monthly (361): 8. April 2018. ^ "100 Squadron". RAF. Archived from the original on 14 June 2018. Retrieved 30 May 2018. ^ "U.K. Makes F-35 U-Turn to Cut Costs, Narrow Carrier-Defense Gap." Archived 5 December 2014 at the Wayback Machine Bloomberg News, 10 May 2012. ^ a b Prince of Wales aircraft carrier ‘makes little sense’ without aircraft to fly from it Archived 7 January 2017 at the Wayback Machine, The Guardian. Retrieved 25 October 2015. ^ Defence Review: Fighting old battles? Archived 27 June 2018 at the Wayback Machine, BBC News. Retrieved 26 November 2015. ^ a b "National Security Strategy and Strategic Defence and Security Review 2015" (PDF). www.gov.uk. HM Government. Archived (PDF) from the original on 24 November 2015. Retrieved 26 November 2015. ^ "First RAF F-35B stealth fighter jet lands in UK". BBC News. 30 June 2016. Archived from the original on 30 June 2016. Retrieved 30 June 2016. ^ "'Protector' UAV fleet to replace RAF Reapers". Flightglobal. 5 October 2015. Archived from the original on 8 October 2015. Retrieved 7 October 2015. ^ "MoD reveals Reaper derivative will be chosen for Protector". Flightglobal. 7 October 2015. Archived from the original on 8 December 2015. Retrieved 7 October 2015. ^ "Key Battle of Britain Fighter Command group to be reformed". St Helens Star. Newsquest Media Group. 11 July 2018. Archived from the original on 11 July 2018. Retrieved 12 July 2018. ^ "Protector makes its way to the UK". Royal Air Force. 11 July 2018. Archived from the original on 12 July 2018. Retrieved 12 July 2018. ^ "RAF announces new Typhoon, Protector squadrons". IHS Janes. 12 July 2018. Archived from the original on 12 July 2018. Retrieved 13 July 2018. ^ "UK sets out post-2030 combat aviation force structure". Janes. 29 July 2014. Archived from the original on 20 August 2014. Retrieved 10 May 2015. ^ "Defence review: Main developments at a glance". BBC News. 23 November 2015. Archived from the original on 24 November 2015. Retrieved 23 November 2015. ^ Allison, George (22 August 2018). "RAF announce that the P-8A Maritime Patrol Aircraft will be 'Poseidon MRA Mk1' in UK service". UK Defence Journal. Archived from the original on 22 March 2019. Retrieved 22 March 2019. ^ "UK Military Flying Training System fixed wing contract achieves financial close". Mott MacDonald. 17 February 2016. Archived from the original on 14 June 2018. Retrieved 31 December 2017. ^ "Hawk T2". RAF. Archived from the original on 19 May 2018. Retrieved 30 May 2018. ^ "New helicopter deal boosts UK's investment in military flying training to £2.8 billion". 20 May 2016. Archived from the original on 22 October 2016. Retrieved 22 October 2016. ^ a b "The RAF Roundel". RAF. Archived from the original on 4 July 2017. Retrieved 31 December 2017. ^ "The Royal Air Force Motto". RAF. Archived from the original on 1 December 2017. Retrieved 31 December 2017. ^ W/C F.H. Hitchins. "It's an albatross, it's an eagle ... it's an eagle". Forces.gc.ca. Archived from the original on 9 June 2011. Retrieved 22 October 2010. ^ a b "Team History". Royal Air Force Arrows. Archived from the original on 3 July 2017. Retrieved 31 December 2017. ^ "Red Arrows". Royal Air Force. Archived from the original on 3 July 2017. Retrieved 7 August 2016. ^ "Central Band of the Royal Air Force". Archived from the original on 3 July 2017. Retrieved 31 December 2017. ^ "RAF – The Band of the Royal Auxiliary Air Force". www.raf.mod.uk. Archived from the original on 29 December 2016. Retrieved 29 December 2016. ^ "The History of RAF Gibraltar". RAF. Archived from the original on 1 January 2018. Retrieved 31 December 2017. ^ "British pilots took part in anti-Isis bombing campaign in Syria". The Guardian. 17 July 2015. Archived from the original on 1 January 2018. Retrieved 31 December 2017. ^ "The brand new RAF Rivet Joint aircraft "fried" Daesh communications with massive jamming attack in Libya". The Aviationist. 19 May 2016. Archived from the original on 1 January 2018. Retrieved 31 December 2017. ^ "The British Army – Joint Helicopter Command". www.army.mod.uk. Archived from the original on 14 January 2017. Retrieved 30 December 2016. The JHC's current deployment in Afghanistan is with the Puma Mk2 which is providing a vital lift capability to the NATO Resolute Support mission in Kabul. ^ "Norwegian Arctic training for UK forces helicopter crews". Ministry of Defence. 19 March 2015. Archived from the original on 1 January 2018. Retrieved 31 December 2017. ^ Eklund, Dylan (2015). "A rock and a hard place". The Official Royal Air Force Review 2015: 118. ISSN 1758-9681. ^ "Britain to boost Falklands Islands defences". BBC. 24 March 2015. Archived from the original on 16 November 2017. Retrieved 31 December 2017. ^ Farmer, Ben (24 March 2015). "Britain's military defences in the Falkland Islands". The Telegraph. Archived from the original on 6 March 2019. Retrieved 3 March 2019. Bowyer, Chaz. History of the RAF (London: Hamlyn, 1977). Dean, Maurice. The Royal Air Force and Two World Wars (Cassell, 1979). Connolly, Corvin J. Marshal of the Royal Air Force Sir John Cotesworth Slessor and the Anglo-American Air Power Alliance, 1940–1945 (Texas A&M Press, 2001). Cox, Jafna L. "A splendid training ground: the importance to the Royal Air Force of its role in Iraq, 1919–32." Journal of Imperial and Commonwealth History 13.2 (1985): 157–184. Gooderson, Ian. Air Power at the Battlefront: Allied Close Air Support in Europe 1943–45 (Routledge, 2013). Heaton, Colin D., and Anne-Marie Lewis. Night Fighters: Luftwaffe and RAF Air Combat Over Europe, 1939–1945 (Naval Institute Press, 2008). Lee, David. Eastward: a history of the Royal Air Force in the Far East, 1945-1972 (Seven Hills Books, 1984). Lee, David. Flight from the Middle East: A History of the Royal Air Force in the Arabian Peninsula and Adjacent Territories, 1945–1972 (HM Stationery Office, 1980). Rawlings, John D.R. The History of the Royal Air Force (1984) well illustrated. Richards, Denis, and David Pilgrim. Royal Air Force, 1939–1945: The fight at odds (1954), the official history. Robertson, Bruce (1967). Aircraft Markings of the World 1912–1967. London: Harleyford. ISBN 978-0900435096. Saunders, Hilary. Per Ardua: The Rise of British Air Power, 1911-1939 (Oxford UP, 1945). Sinnott, Colin S. The RAF and Aircraft Design: Air Staff Operational Requirements 1923-1939 (Routledge, 2014). Smith, Malcolm. British Air Strategy Between the Wars (Oxford, The Clarendon Press, 1984). Wikimedia Commons has media related to Royal Air Force. Wikimedia Commons has media related to Aircraft of the air force of the United Kingdom.